Shard decks aren't new, but I seem to be first posting a 1.28 one -- and I'm sad to say none of the new cards from 1.28 made it into this. 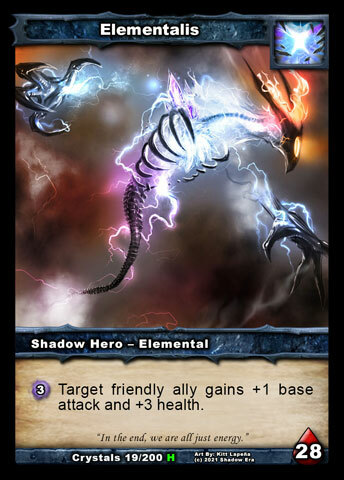 I picked Elementalis because I'm not using "her" as a competetive Hero in 1.28 and her ability pretty much is only good for weenies which suits rush perfectly. 1. Ignore the AI allies -- they won't attack yours *cough, Wulven please get a clue and change the programming, cough*. 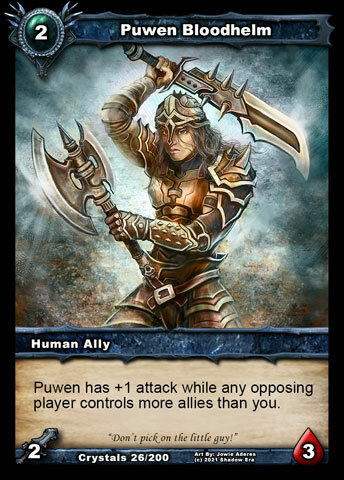 Yes, you'll be scared to ignore the Puwen with your 5/1 guy out there on turn 3 and any real player would kill your ally. But have no fear, Puwen /any AI ally WILL ignore it. 2. 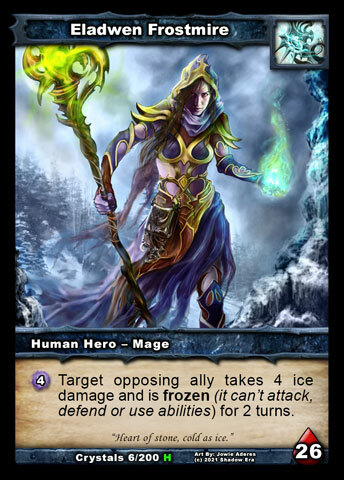 Heroes: Even Eladwen 's ability will just target you, not your allies. The only one to worry about is Nish, and you'll probably kill him before he has 5SE. He's actually the fun one to play, it's a race against yourself, solitaire style: can you kill him before he wipes the board? tune in to find out! (spoiler alert: the answer is Yes). 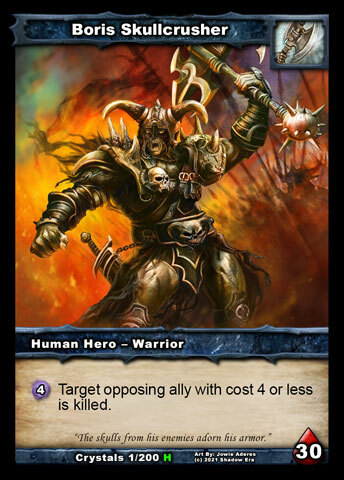 Boris can also be apain -- weapon users WILL target your allies, and Sharded 1 Def allies will fall fast. You'll still win by turn 5 but it will be closer if you choose Boris . Last edited by graphlem; 10-23-2011 at 07:42 AM. Best hand (4 spark, obviously) can be T1 fire snake, T2 hellsteed hellsteed, T3 shard of power, T4 blood lust, and you win the game. 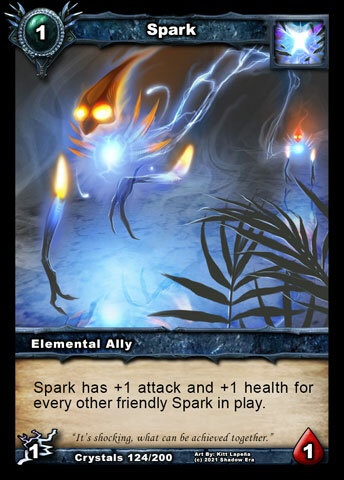 Never play multiple spark then shard of power or boris will kill them in one swing with jewelers dream, keep a shriek in hand to destroy a T4 jewelers dream. And kill jasmine, always. Don't need Shrieks or other Item Dest; only thing that can possibly give you a problem is Wizent's or JD, and you can power thru them. 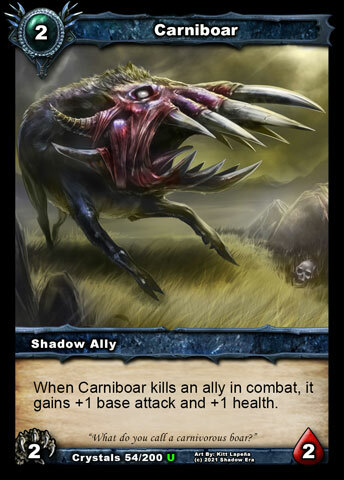 Well, i just gave my version, it's not a critic of yours... And if you can't win by T5, a shriek can break a jewelrs dream and allow you to attack & keep your creature alive, like i said i used to play against boris, and a T3 jasmine (crippling blow), T4 jewelers dream, T5 enrage can slow you down, that's why a shriek is welcome to win the game T6. True, no worries Kentuequi I've found for me that the extra four 1/2cc allies instead of Shrieks is enough to plow thru anything the AI will throw at you and won't be a dead draw if they throw nothing at you. Method seems different now; Elementalis 's ability keeps your biggest Sharded ally alive despite a weapon. Still working in v1.5, actually Elementals' grind deck are still the best since the first one posted by AnAdolt for v1.23.